Try this method for moist chicken with super crispy skin. To spatchcock is to remove the backbone of a chicken (or turkey) and flatten it so it has maximum contact with the pan. A sheet pan will yield the same glorious results so don’t get hooked on the cast iron pan. So what’s the big deal about spatchcocking? By removing the backbone and flattening the chicken, more of the meat has direct contact with the hot pan, allowing for shorter cook time and more even cooking. The result yields moist white meat and perfectly cooked legs. Adding to the allure, the skin is extra crispy in a way I’ve rarely achieved without drying out the breast meat. Juicier results mean the chicken is out of this world the next day, when you’re ready for leftovers that morph into the best chicken salad you’ve ever tasted. I was not a believer until I tried it. With a 14” cast iron pan staring me down as I contemplated WHY I should bother, I planned this around the time my hubby could help. My years as a vegetarian still prevent me from taking shears to bone. Kitchen gloves help the squeamish. And unlike marinating chickens in ingredients like fresh lemon, wine or other wet ingredients, as one does before roasting, the key to a perfectly spatchcock chicken is a dry bird (with yes, a little olive oil) and a dry pan. Embrace the differences and you’ll have evenly cooked, moist-on-the-inside and crispy-on-the-outside chicken with herbal notes that will leave you salivating for leftovers at Shabbat lunch. Here’s how to spatchcock your chicken from Tasting Table. It sounds way more complicated than it is. Don’t have a cast iron pan? 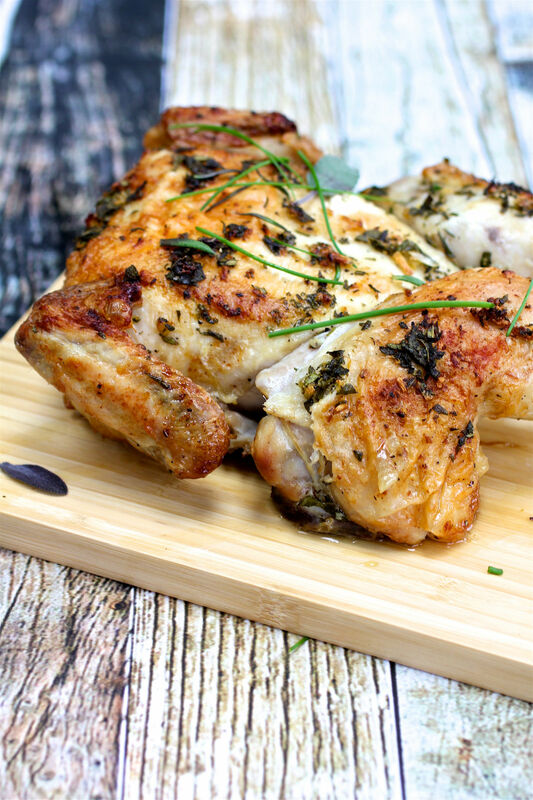 Here’s how to roast a spatchcock chicken on a sheet pan instead. TIP: Preheating your pan at the same time as your oven temperature climbs is a foolproof way to yield crispy skin. 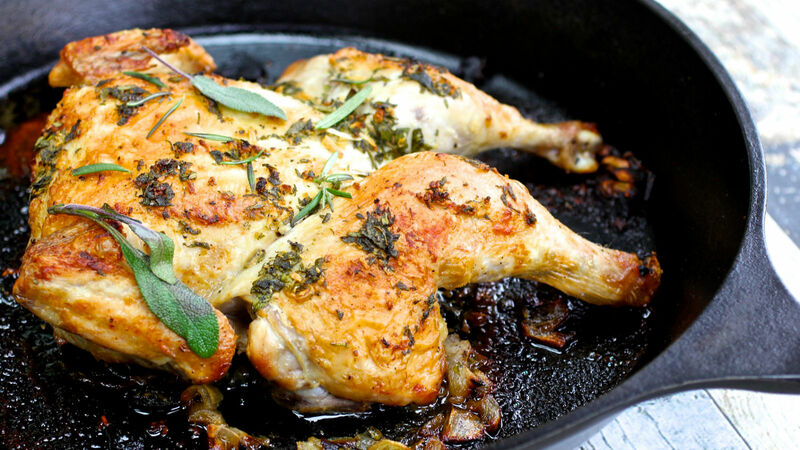 Hear that sizzle when you place your chicken on that screamin’ hot pan? That’s your guarantee the pan is ready and the result will be perfect. Place chicken on a board, breast side down. Using a kitchen shears cut along both sides of the backbone and remove it (save in freezer for soup or stock). Flip chicken over so breast side is up. Place both hands on the chicken, pressing firmly down to flatten it as much as possible. Pat chicken dry with paper towels. Season with 1 Tbsp olive oil and salt and pepper. With breast side down, scatter chopped shallots into cavity and place chicken aside to rest. Place cold cast iron pan into oven and preheat to 425 degrees F for 20 minutes. If your preheat timer dings sooner than 20 minutes, allow preheating to continue. You want your pan “screaming” hot. In a small bowl, combine remaining 2 Tbsp olive oil with herbs and garlic, forming a paste. Remove hot pan from oven and place chicken in pan, breast side down. Roast, uncovered, for 30 minutes. Remove pan from oven and flip chicken over, so breast side is up. Brush with herb/olive oil paste and return to oven for 10 minutes. Using a meat thermometer, test for 165 degrees in thigh. Remove from oven and allow to rest uncovered for 10-15 minutes before slicing. This go-to chicken and rice dish looks gorgeous, tastes incredible, comes together in no time, and you can make it all in one pan.